As President Obama prepares to host Chinese President Hu Jintao next week, Americans increasingly see Asia as the region of the world that is most important to the United States. 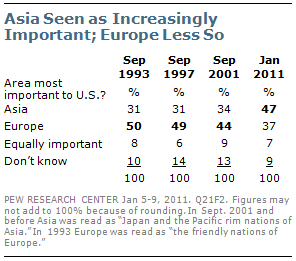 Nearly half (47%) say Asia is most important, compared with just 37% who say Europe, home to many of America’s closest traditional allies. Views on this issue have changed considerably over the last decade. In an early September 2001 poll, 44% said our political, economic and military ties to Europe were more important, while 34% prioritized our ties to Asia. Similarly, in polls conducted in 1993 and 1997 about half felt Europe was the region most important to American national interests, while roughly three-in-ten said Asia. This shift reflects changing perceptions about the economic balance of power in the world. Almost half (47%) of Americans say China is the world’s leading economic power, while just 31% name the U.S.
Three years ago — prior to the global economic crisis — only 30% characterized China as the global economic leader, compared with 41% for the U.S. The latest national survey by the Pew Research Center for the People & the Press, conducted Jan. 5-9 among 1,503 adults finds that by two-to-one (60% to 27%) Americans see China’s economic strength as a greater threat than its military strength. And as Obama goes into talks with the Chinese president, a 53%-majority say it is very important for the U.S. to get tougher with China on trade and economic issues. Yet while Americans may see China as a problem, relatively few describe it as an adversary, and a 58%-majority say it is very important to build a stronger relationship between the U.S. and China. By comparison, promoting human rights and better environmental policies and practices are important, but lower priorities. American views of China are not extreme in a global perspective. A 2010 Pew Global Attitudes Project survey found roughly half of Americans expressing a favorable opinion of China, while 36% said they felt unfavorably. In that survey, attitudes toward China were far more negative in France, Germany and Turkey, as well as among the publics of some of China’s neighbors, such as Japan, South Korea and India. By contrast, China is viewed in an overwhelmingly favorable light in places like Kenya and Nigeria (where the U.S. is also viewed very favorably) as well as in Pakistan (where opinions of the U.S. are mostly negative). Nearly half (47%) of Americans see China as the world’s leading economic power, while 31% say the United States holds that position. As recently as February 2008, the positions of these two countries were reversed: 41% named the U.S., and 30% China as the world’s leading economic power. Few Americans (6%) place the countries of the European Union in the top position. Similarly, only 9% think Japan occupies the top spot — a stark change from the late 1980s and early 1990s, when concerns about Japan’s growing economic power were widespread. In fact, a January 1989 survey found that by a two-to-one margin, Americans believed Japan was the world’s dominant economy: 58% considered Japan the top economic power; only 29% named the U.S. While Americans believe China has assumed the leading position in the global economy, they see the military balance of power quite differently. Two-thirds (67%) think the U.S. is the world’s leading military power. Just 16% say China has the top military, while 5% name Russia and 3% the EU. 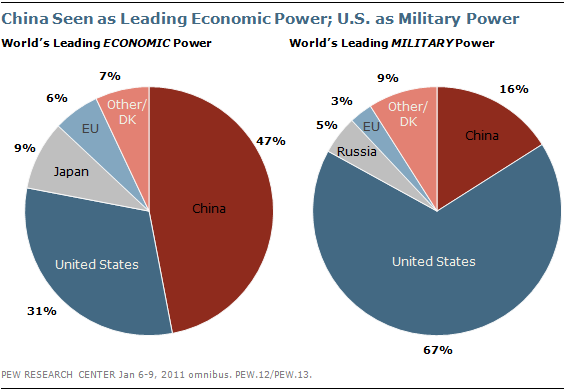 In keeping with this, Americans view China primarily as an economic threat, rather than a military one. When asked whether they are more concerned about China’s economic or military strength, more say the former by roughly two-to-one (60% vs. 27%). One-in-five Americans identify China when asked to name the country representing the greatest threat to the U.S., up from 11% in November 2009. This is the highest percentage volunteering China as the greatest danger since a September 2001 poll taken prior to the 9/11 attacks and just months after the dispute over a U.S. surveillance plane that was held by Chinese authorities for several days on the island of Hainan. 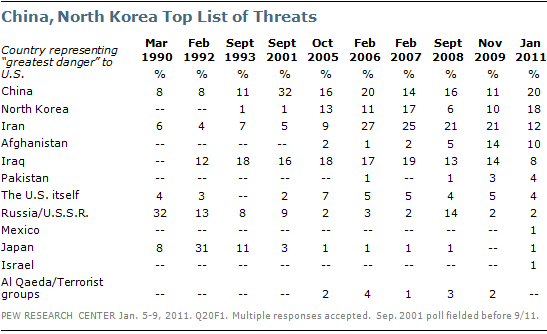 China (20%) and North Korea (18%) top the list of global dangers, followed by Iran (12%) and Afghanistan (10%). For the first time in more than two decades, fewer than 10% name Iraq as the leading threat. When the Pew Research Center for the People & the Press first asked this question in March 1990, roughly one-in-three Americans (32%) rated the Soviet Union as the biggest danger to the U.S. By February 1992, with the Soviet Union no longer in existence, Americans believed Japan’s rising economic power posed the greatest threat. While Americans see China as a rising global power, relatively few characterize the U.S.-China relationship as adversarial. Only 22% describe China as an adversary, 43% say it is a serious problem, but not an adversary, and 27% believe China is not much of a problem. The view that China is not a problem is especially common among young people: 42% of 18-29 year-olds hold this opinion. Views on this question have been relatively stable since it was first asked in 1997, although the percentage who consider China an adversary has increased somewhat since 2004, when just 14% saw China this way. For the most part, views about China and its military and economic strength do not vary considerably along partisan lines. Yet, Democrats and Democratic-leaning independents express more positive opinions of the Sino-American relationship than do Republican and Republican leaners. While majorities in both groups say relations between the U.S. and China are staying the same, 22% of Democrats say relations between the two countries are improving, compared with just 9% of Republicans. In 2004, when this question was last asked, 16% of Democrats and Democratic leaners and 21% of Republicans and Republican-leaning independents said relations between the two countries were improving. When asked about their view of China, 47% of Republicans and Republican leaners and 43% of Democrats and Democratic leaners describe that country as a serious problem, but not an adversary. Republicans are somewhat more likely than Democrats to see China as an adversary (24% vs. 19%, respectively); conversely, Democrats are slightly more likely than Republicans to say China is not much of a problem (29% vs. 23%). Among Republicans and Republican-leaning independents, those who agree with the Tea Party offer more negative views of China and Sino-American relations than do those who disagree with the Tea Party or have no opinion of the movement. 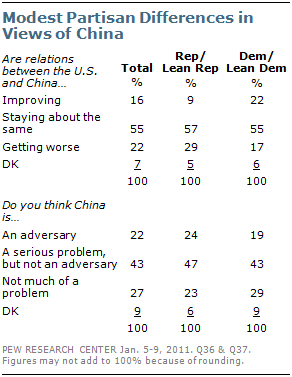 One-third of Tea Party Republicans describe China as an adversary, compared with 17% of other Republicans and Republican leaners. And while 34% of those who agree with the Tea Party say relations between the U.S. and China are getting worse, 24% of Republicans who disagree with the Tea Party or do not have an opinion of it say that is the case. 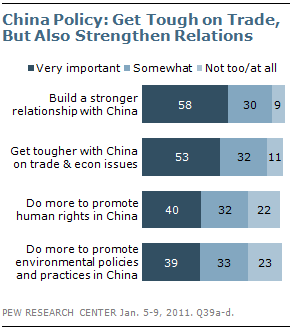 Democrats and Republicans also offer different views about U.S. policy toward China. The partisan gap is especially notable in regards to the promotion of human rights; 48% of Democrats and Democratic-leaning independents say is very important for the U.S. to do more to promote human rights in China, compared with one-third of Republicans and Republican leaners. Democrats and Democratic leaners are also more likely than Republicans and Republican-leaning independents to say it is very important for the U.S. to do more to promote better environmental policies and practices in China (43% vs. 34%, respectively). And while majorities among both partisan groups say it is very important for the U.S. to build a stronger relationship with China, more Democrats say that is the case (62% vs. 54% of Republicans). On trade and economics, however, Democrats and Republicans offer similar views; 54% of Republicans and Republican leaners and 52% of Democrats and Democratic leaners say it is very important for the U.S. to get tougher with China on economic and trade issues. 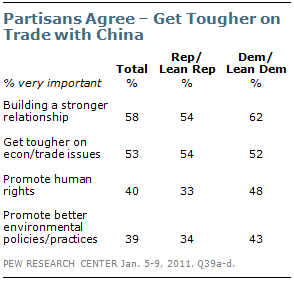 But among Republicans, those who agree with the Tea Party are more likely than those who do not to place high priority on the U.S. getting tougher with China on economic and trade issues; 60% of Tea Party Republicans say this is very important, compared with 49% of Republicans and Republican-leaning independents who disagree with the Tea Party or do not have an opinion of it.